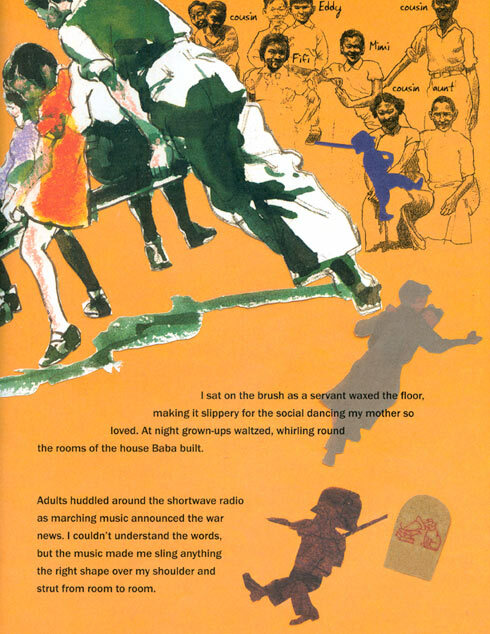 It’s a double blessing to encounter Ed Young‘s childhood memoir, The House Baba Built (see my earlier article here); and to follow up with Allen Say‘s memoir of growing up with his mentor, in Drawing from Memory (illustrated below), when selections from both books are also in The Original Art Show. 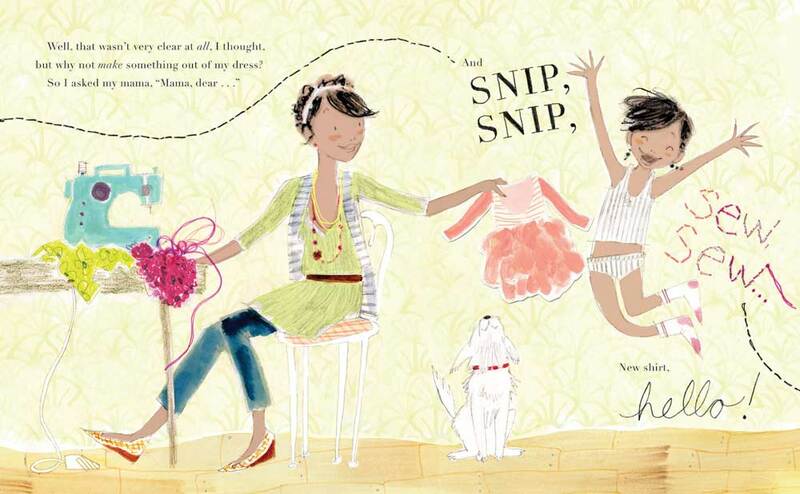 This aptly describes the spunky exuberance of her visual story-telling, coupled with superb draftsmanship, plus an innate knowledge of how a child’s mind operates. 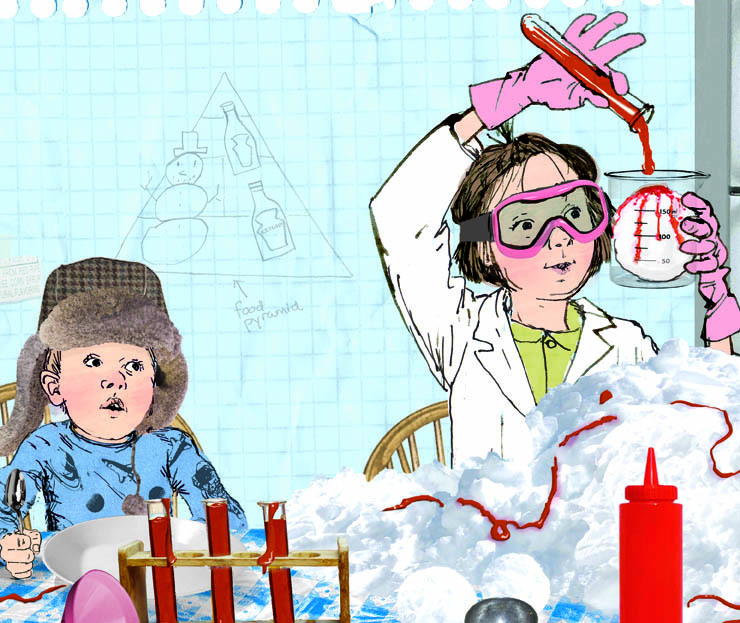 I asked her to share highlights with us from her Original Art Show selection, 11 Experiments That Failed, and she sent the following images, alongside her comments. 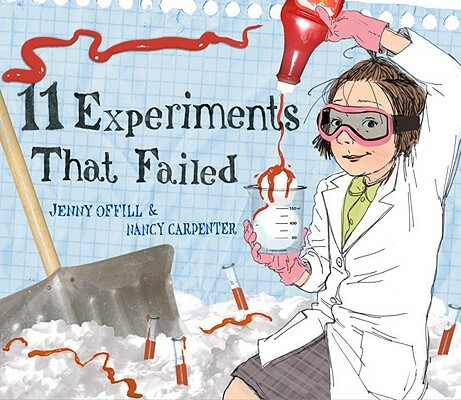 The protagonist here starts out with the exuberant confidence she displayed in 17 Things I’m Not Allowed to do Anymore (Jenny Offill & Nancy Carpenter‘s previous book together). 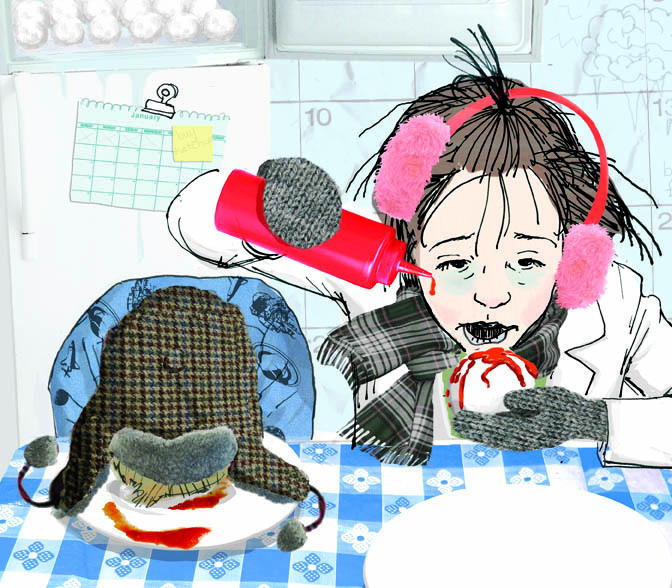 The experiment is having some effects on her and her brother after what could be several days of the snow and ketchup diet (figure 2, right). 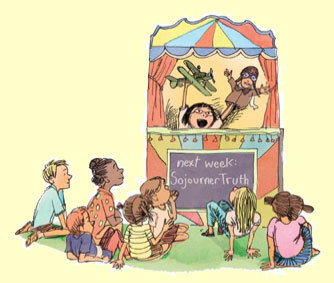 Here’s another experiment, called “What makes fungus grow” (figure 3, below). 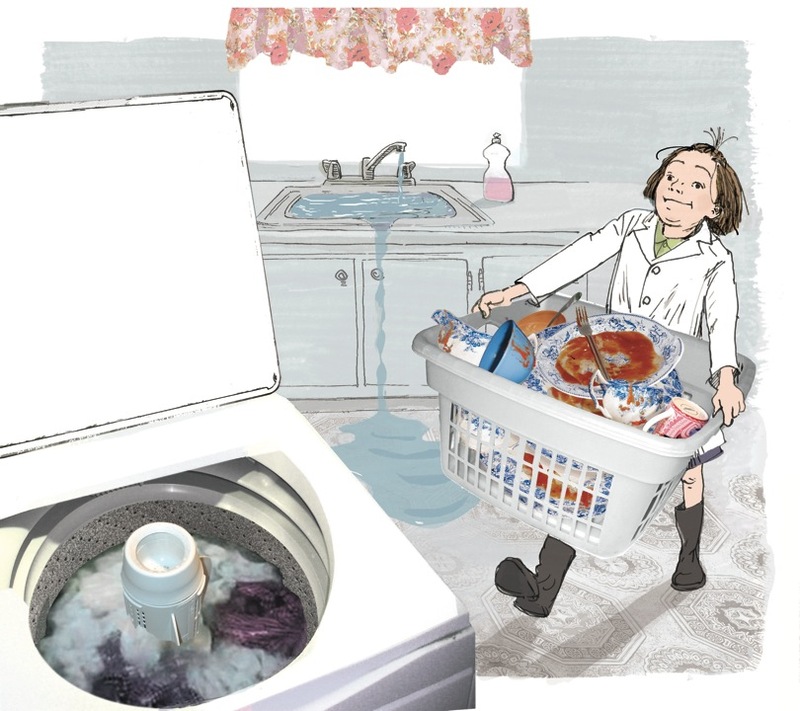 NC: This experiment, called “Can a washing machine wash dishes?” (figure 4, below), is very close to one I have tried (and failed at) — Can the dishwasher wash my socks? 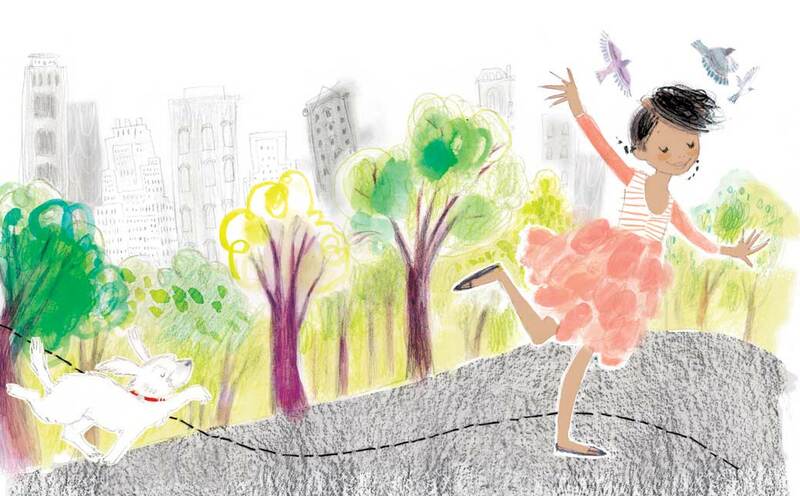 Joy Chu: These pieces are so delightful and full of life. Every detail tells its own story! 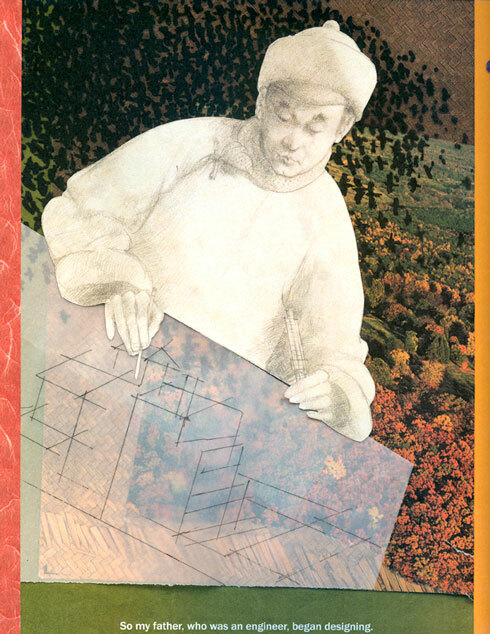 Do you create a foundation of sketches; that is, clean up & add ink; make scans first; then add layer upon layer via Photoshop? How’s that for a multi-layered question? NC: I do my drawing in india ink on bristol board. I typically draw freehand with my sketch as my reference. I like the unexpected mistakes drawing with permanent ink creates. It makes the lines more lively and spontaneous. The downside is that I often need to do dozens of drawings to get one that looks like I just sat down and quickly drew it. 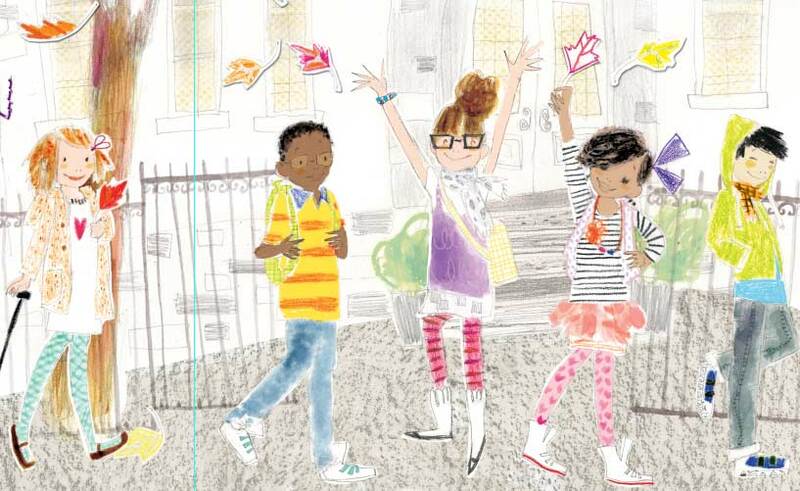 I then scan the black lines and add colors with layers of collage, or layers of paint swatches with Photoshop. If you look carefully, sometimes you can see the strokes from one layer going in one direction and then another thin color layer going in another direction. I haven’t used real paint in quite a few years. This approach is far less toxic or messy. I do, however, miss having a finished painted piece. JC: Which one of these is the piece that’s hanging in the Original Art Show? NC: The piece I used in the Original Art Show is the washing machine washing dishes. I felt, among all the art, it conveys the essence of the character as well as the idea of that particular experiment, without needing words. JC: You provided a print-out, then. Who took care of the framing? NC: I had it framed myself, with a black frame and later painted the frame a Pepto-Bismol®pink. I thought [the effect] was more light-hearted and fun. I enjoyed your link [on the public Got Story Facebook page] to a blog article by Will Terry — Get Over It — You’re Just Another Artist! My sentiments exactly. At first I started out determined to win awards and be on top. Now, years later, I’m just happy to be able to do this full time, and continue to get work. I go to the Original Art Show to see if anyone is worse than I am and still allowed to hang a piece of art. It makes me feel momentarily above average. JC: I can think of no one else who does smart and spunky, naughty yet charming, little girls better, nor more colorfully, than you do. Thank you for sharing your process with us. 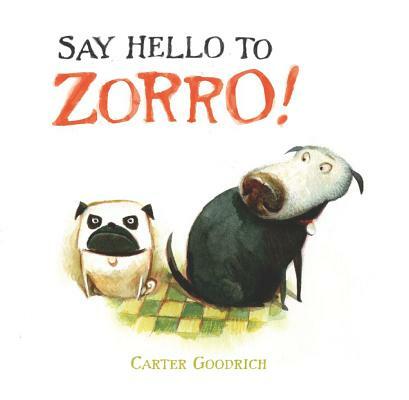 While Carter Goodrich‘s dogs, Zorro and Mr. Bud (right), won a place as a selection (and in the official Society of Illustrator’s catalog), circumstances prevented getting an original piece from Say Hello to Zorro! on display at the show itself. 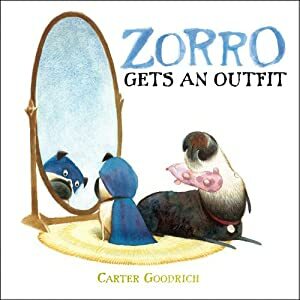 Check out Carter Goodrich‘s website, which includes his animation work and studies for many familiar Pixar characters. 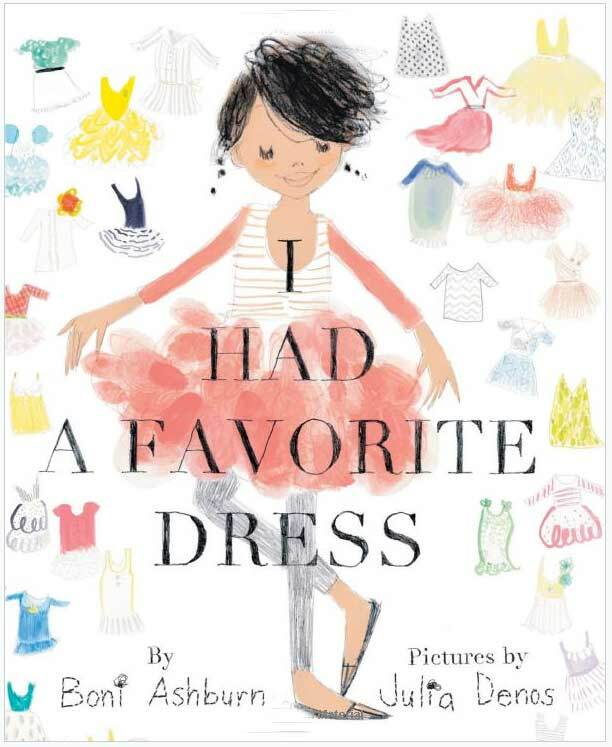 We switch gears to an art style that’s soft-with-panache, via selections from two books — I Had a Favorite Dress, and Just Being Audrey, both illustrated by Julia Denos. Julia’s exquisite line work, design sense, and spare application of color displays the influence of her affiliations with advertising for luxury living spaces, alongside fashion-themed flair. 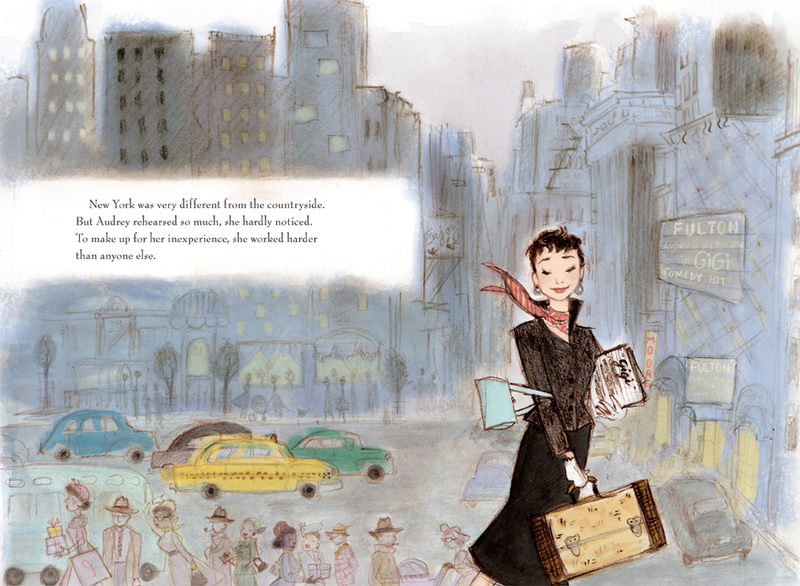 The picture book as memoir offers infinite possibilities. 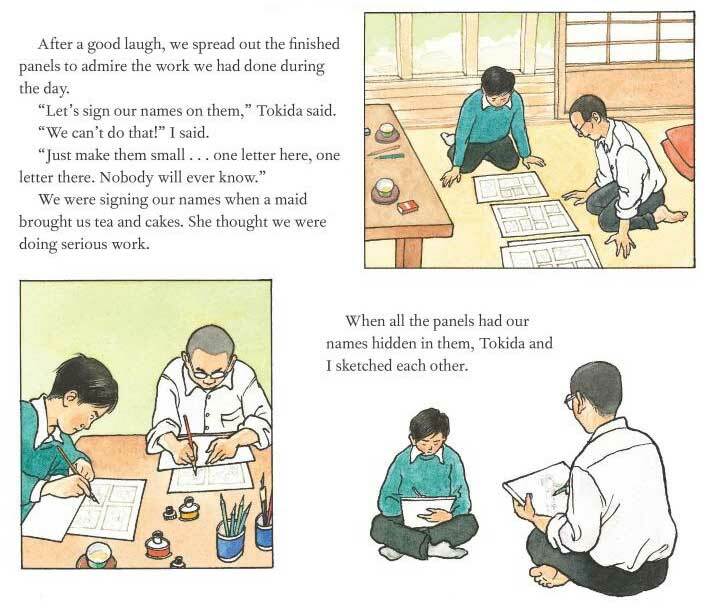 Reminiscences about family are an invaluable treasure trove of ideas. Sharing stories can unplug a well-spring of long forgotten tales from family and friends that might not otherwise surface. 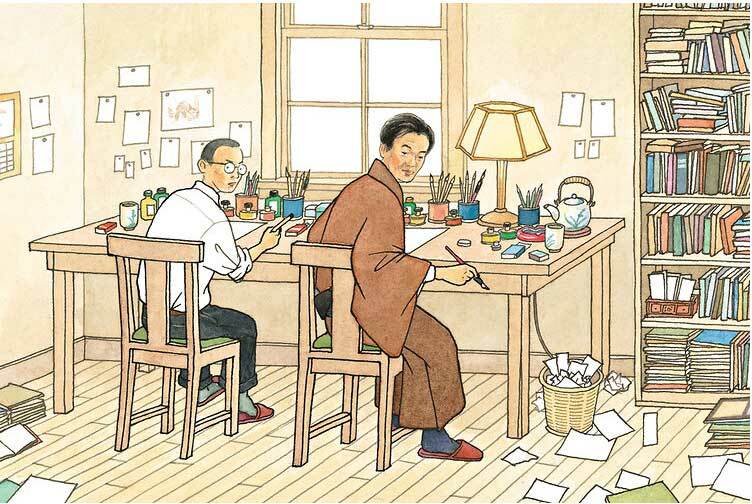 Yes, you can collaborate with your family on a picture book story! 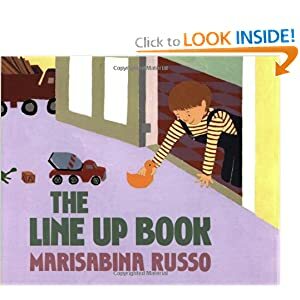 I’ve been a long-time fan of Marisabina Russo‘s work, from her early beginnings as an artist for newspapers and magazines like The New Yorker, to her current career as picture book author/illustrator. 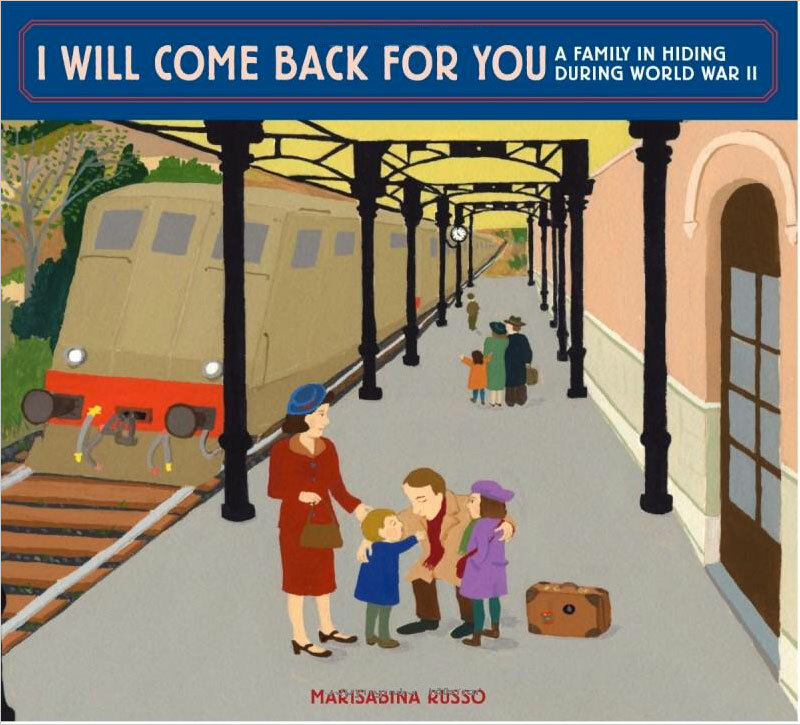 Here is the trailer for her latest book, I Will Come Back for You: A Family in Hiding During World War II (Schwartz & Wade/Random House), about being separated from one’s father and fleeing into the mountains against the backdrop of the Holocaust. 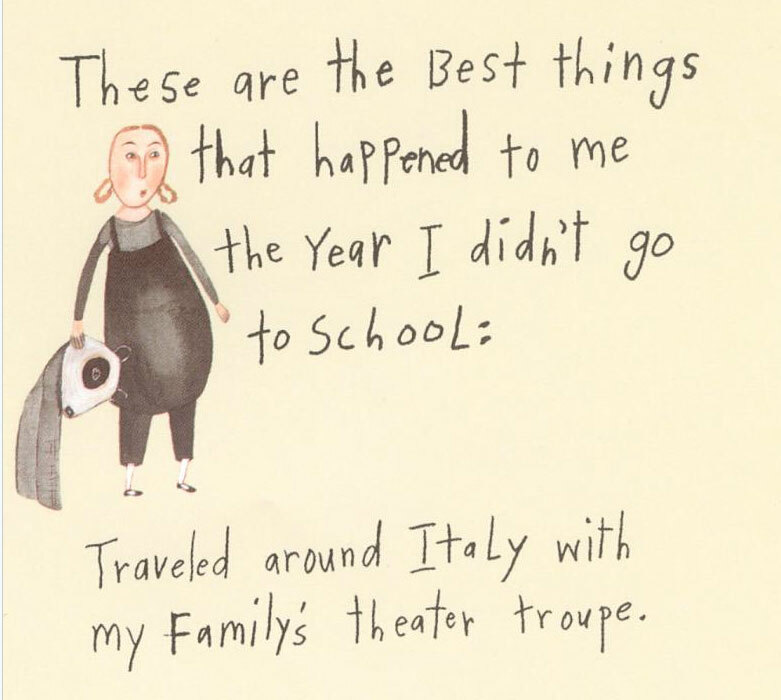 It’s a true story, as told to the author by her grandmother. 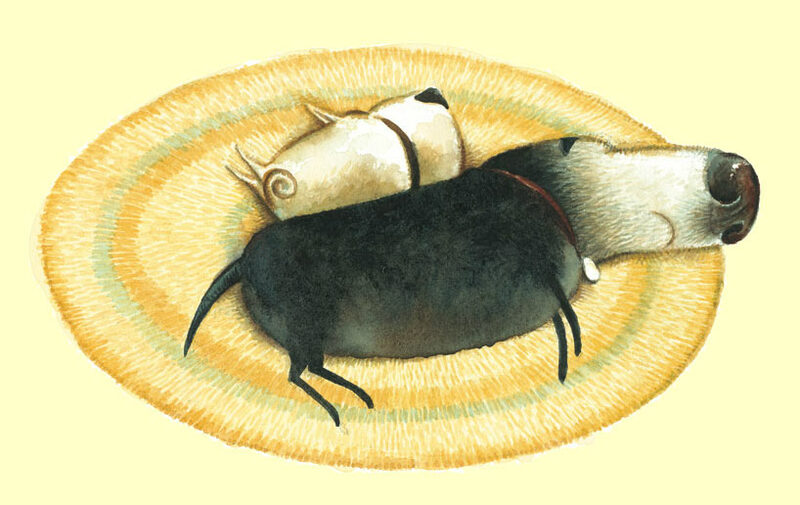 Her debut, The Line-Up Book (Greenwillow), was a well-worn out family favorite in my household. 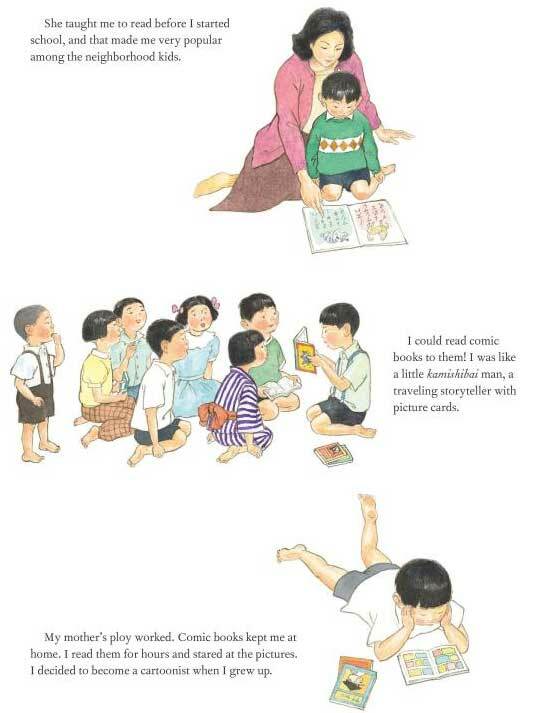 It recalls one special day in the life of a mother and son. Still in print (first published in 1986), it continues to strike a universal chord. 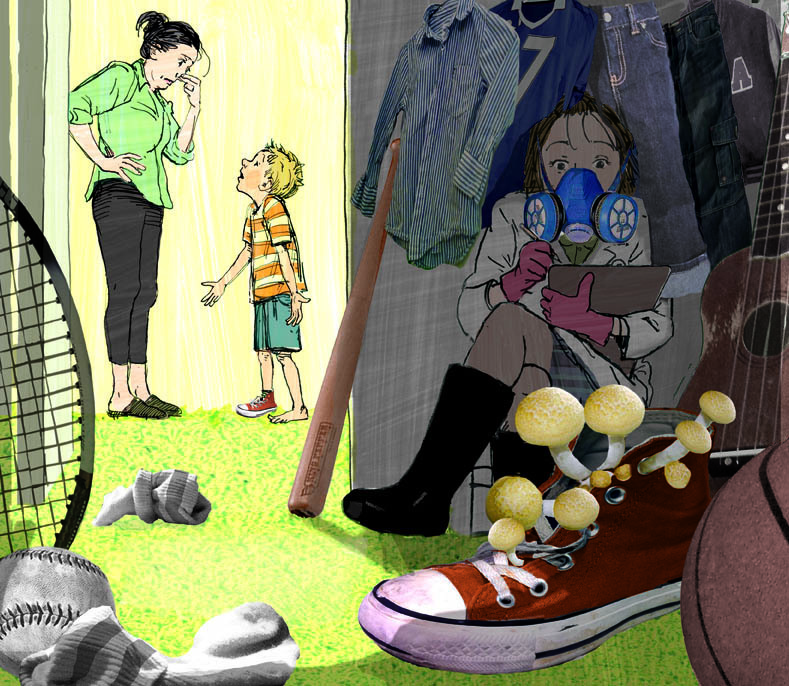 Revisiting that story brought back a rush of remembrances of how inventive my little son was during his cozy ‘alone’ moments at home. 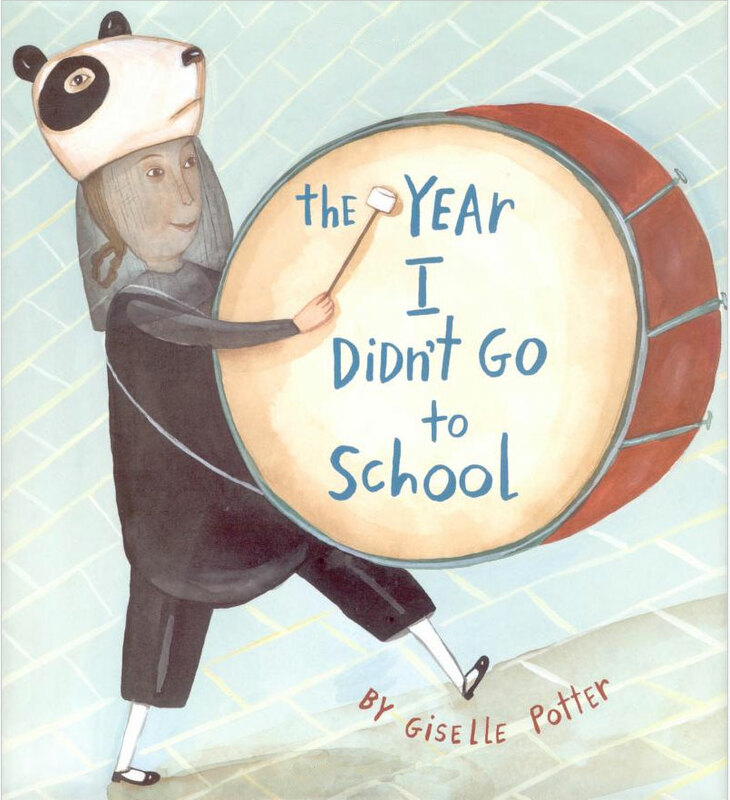 Encountering the above mentioned picture book memoir brings to mind Giselle Potter‘s The Year I Didn’t Go to School (Atheneum/Anne Schwartz). 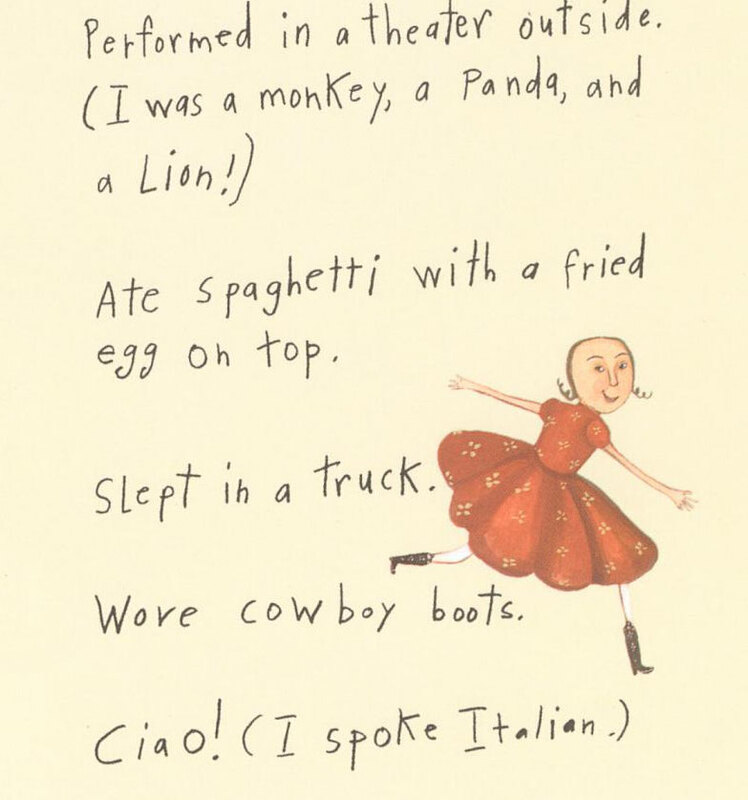 Of particular note is the clear voice of the narrator, who doesn’t find it unusual to take a year off from school to join her bohemian family with a circus troupe in Italy. 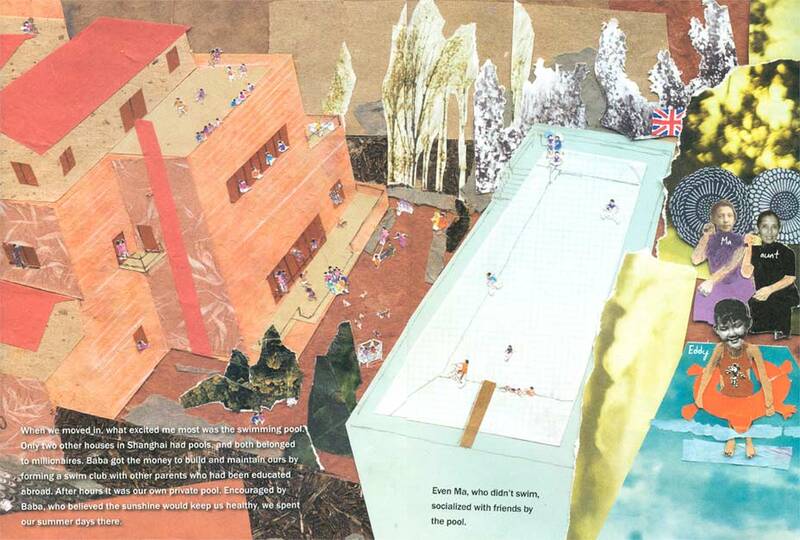 I felt the concern of the grandparents through the illustration, as they watch Giselle’s family take off at the airport. 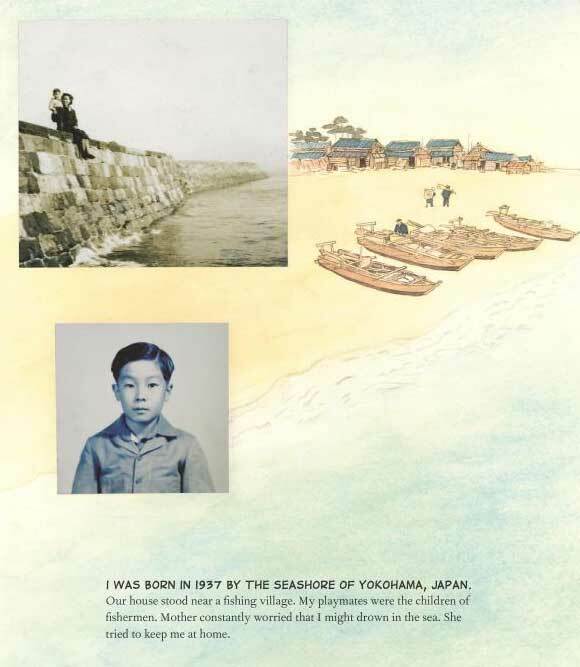 Ed Young shares vivid memories of his childhood in Shanghai during WWII in The House Baba Built(Little Brown). 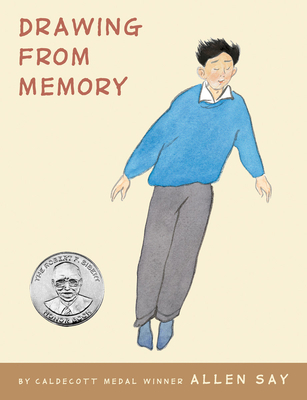 Cited by Publishers Weekly as one of the Best Children’s Nonfiction Picture Books of 2011, it is also a Junior Library Guild Selection. 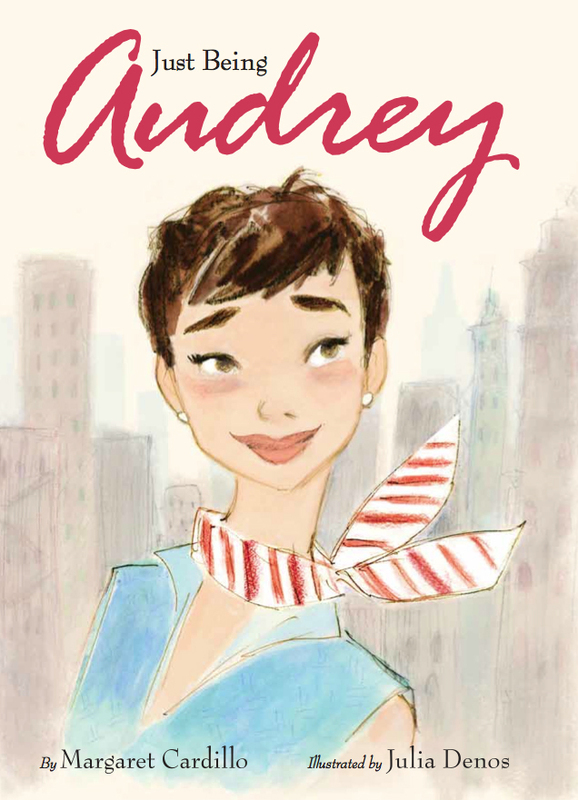 It also garnered wide critical acclaim plus starred reviews from Publishers Weekly, School Library Journal, and Booklist. 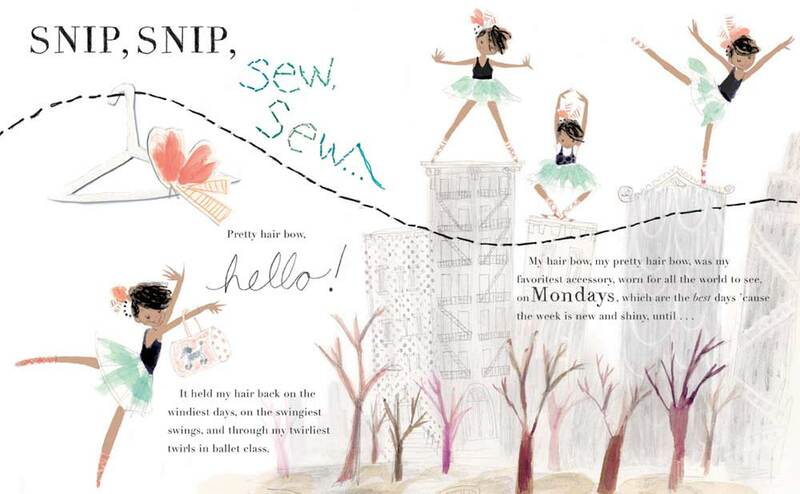 The book is chock full of rich anecdotes, sumptuously illustrated with torn and cut paper, pencil, chalk, pastel, ink, paint, and photographs. A labor of love, it features eight (yes 8!) gatefolds. — provided that Ed’s family could live there for twenty years. The landowner agreed. 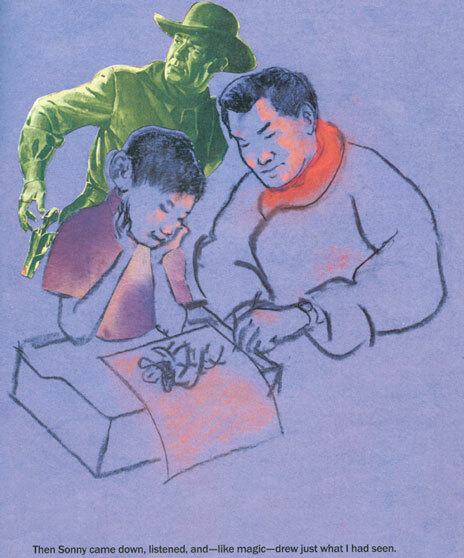 See Ed Young discuss children’s book illustration and his previous work on Shanghai Messenger, written by Andrea Cheng, published by Lee & Low (below). 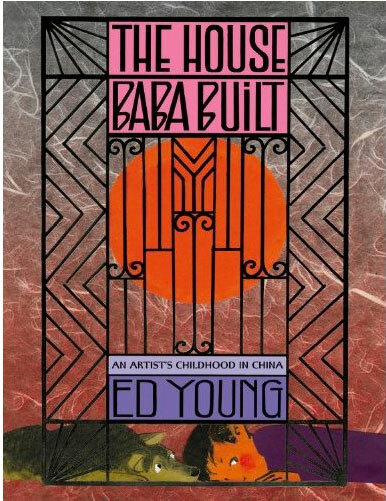 If you’re in NYC, don’t miss your chance to view an Ed Young original up-close, from The House Baba Built at the Original Art Show. 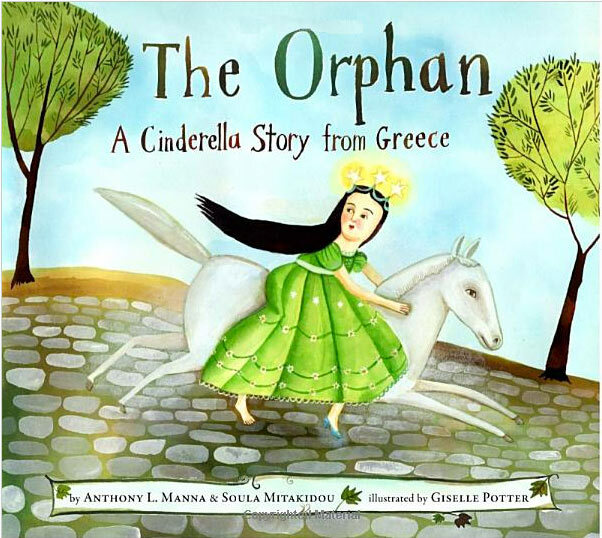 Also on display is an illustration from Giselle Potter‘s latest book, The Orphan: A Cinderella Story from Greece (Schwartz & Wade), written by Anthony L. Manna and Soula Mitakidou. And watch for more from our series covering The Original Art Show, right here at the Got Story Countdown!